Offer to get a free Panda Internet Security 2009 license key valid for 1 year. This is a joint promotion between Panda and Softonic where by two companies will each give 6 months subscription and it adds up to a year. Please don’t misunderstand because it doesn’t involve uninstalling and reinstalling like the Norton OEM trick. Hmm Panda Internet Security 2009, it’s not as famous as Kaspersky, so what’s good about it? As you know every antivirus has their own heuristic technology such as Norton SONAR, Kaspersky proactive, F-Prot Eldorado, BitDefender B-HAVE, F-Secure DeepGuard, Panda Collective Intelligence and etc to detect previously unknown computer viruses, as well as new variants of viruses already in the wild. According to AV-Test, the latest Panda Internet Security 2009 seems to perform really well in this area with its Collective Intelligence technology by scoring the highest (even outscoring Kaspersky). So if you’d like to try out, here’s how to get a free Panda Internet Security 2009 genuine license key worth US $79.95! Enter your email, password, username, firstname, lastname, date of birth, select your Gender and click “Mein Konto erstellen” button. 3. You will now need to activate your Softonic account. Check your email and you should receive an email from Softonic (push@softonic.com) with the subject Anmeldung bei Softonic.de bestätigen‏. Click the bold link named 'ANMELDUNG BESTÄTIGEN' that you see in that email to activate your account. 5.Go to http://www.softonic.de/preis-gewinnspiel/weihnachten and note down the Seriennummer displayed at the webpage. From First step choose your Language and Country And click Next. Then chose 'NO' in 2nd step from drop down menu and click NEXT. And also choose 'NO' in 3rd step from from drop down menu and click NEXT. Now we are going to 4th step the main part.Fill all the required fields in form and enter the Seriennummer that you got from step 5 into Activation code box. 7. Check your email that you entered in step 6. You should receive an email from yourdetails@pandasecurity.com with the subject Welcome to Panda Security. Note down the username & password, Activation Code and Customer Number. and login with the username & password that you got from step 7. 9.Download Panda Internet Security 2009. You MUST login in order to download or else you will get the error Access Denied. 10. Open Panda Internet Security 2009 from the system tray, go to Help > Activate the product. Click Next, enter your Activation code, email address and click Next. Make sure Yes is selected when asked are you a Panda Security client. Enter your client number which is actually your “Customer Number” and select your country from the drop down list. Click Next. You will now see that the license expires information stated in the program is one year ahead. Go ahead and grab your free Panda Internet Security 2009 license key before this offer expires! This application allows you to reuse your USB flash drive to access your Windows. · Stores and auto-fill Windows password by using your USB flash drive. · Shows clock, date and customized text messages on the welcome screen. · Set new shutdown dialog (loggoff screen) with customized picture, always visible hibernate button and 'on computer' time counter. · Allows you to edit user list on the welcome screen. 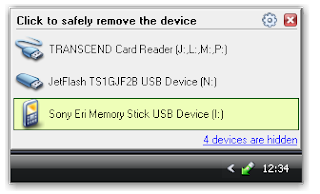 · Automatically locks your desktop upon removal of the USB stick (flash drive). 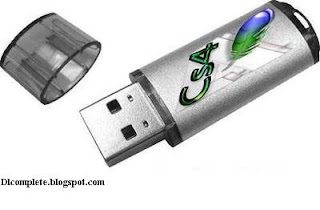 · Protects USB flash drive by PIN code entry. · Anti-keylogger features: Virtual keyboard for PIN code. · Secures your shares by eliminating unwanted access to your shared folders. · Caption and text messages (works like reminder). You say Easy Yes! The FastSatfinder will speak you the signal strength and/or quality and has many other cool features built in that are helpful for the novice and more advanced user. New Version 5.0 Now Available! Designed exclusively for Windows, Casper makes it a snap to keep an instantly bootable backup hard disk for your system. When disaster strikes, you can use your backup as a complete and immediate replacement for your original hard disk. It's that easy! *Casper creates a complete copy of your system hard disk, including the operating system, applications, settings, and all of your data. * Easy-to-use wizards quickly guide you through the process step-by-step. * Safely test-boot your system from a backup at any time for added assurance! While other solutions promise ease of use and peace of mind, Casper delivers using state-of-the-art technology designed specifically for Windows. Clear, easy-to-follow wizards guide you through the entire process step-by-step, while features such as SmartStart™, 1-Click Cloning™, and Integrated Scheduling ensure anytime is right for a backup. You can schedule a backup copy to be performed automatically -- daily, weekly, monthly, or at any time desired. Casper's exclusive Advanced Power Management functionality can even wake your computer in the middle of the night to perform a copy completely unattended and then safely return it back to sleep while you sleep! With Casper's exclusive 1-Click Cloning support, on-demand backups are just a click away too. And by taking advantage of new Vista specific features such as I/O prioritization and I/O cancellation support, Casper's exclusive Automatic Performance Throttling support ensures the backup completes entirely in the background without interfering with your work. Casper's exclusive Automatic Copy Verification brings backup dependability to a new level by automatically verifying the backup during the cloning process. With Automatic Copy Verification, you can rest easy knowing that your backup has not been compromised by faulty RAM, a defective cable, failing disk, or bad controller interface. 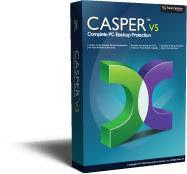 In the event of a hard disk failure, the backup copy created by Casper can be used as an immediate and permanent replacement for the failed hard disk. Since Casper does not store your data in a proprietary format, there is no special rescue disk or lengthy data restoration process required to facilitate a recovery. You have complete and immediate access to all of the data on your backup. In fact, testing a backup created with Casper is as easy as restarting your computer directly from the backup hard disk. Recovering from a hard disk disaster doesn't get any easier! Microsoft Windows may have got more advanced but the need for effective maintenance is greater than ever. If you don?t houseclean your computer system regularly the digital garbage that collects over time makes it slower and can even cause inexplicable errors ? usually when you need them least. 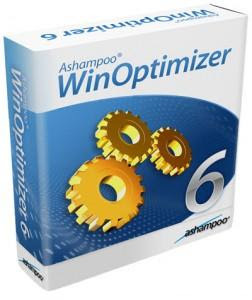 With the reliability of 11 years of experience, Ashampoo WinOptimizer 6 makes Windows maintenance fast and easy ? and it works for Windows XP just as well as it does for Vista. The One-click Optimizer does what it says and you can even schedule it to run automatically so that you don?t need to think about it at all. It keeps your Windows computer running as fast and smoothly as on the first day you bought it. In addition to efficient Windows maintenance you also get a whole suite of powerful, easy-to-use tools that enable you to configure and tune your Windows computer so that it works exactly the way you want it to. - AntiSpy Module - New! - Context Menu Manager - New! 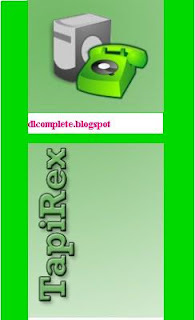 - Hard Disk Defragmenter - New Version! Defrag 3 Disk Defragmenter and Service As you use your hard disk the information on it becomes ?fragmented?, making your computer slower. The brand-new Defrag 3 disk defragmenter does the best job ever of defragmenting your hard disks and it comes with a new background service that automatically keeps your hard drives defragmented whenever your computer is idle. The advanced new Boot Time Defragmentation makes Windows start faster. You can run Defrag 3 manually or schedule it to run at regular times or intervals. The continuous background service with a new predictive defragmentation algorithm actually prevents fragmentation before it can happen. It automatically cuts in and defragments your hard disk when your computer is idle, never interfering with your work or other programs. The result is hard disks that are always ?freshly defragmented?. This module provides a collection of settings for Windows services and other programs that like to ?phone home? and tell Microsoft or their manufacturers about your computer and what you are doing. The settings let you control and stop this behavior to protect your privacy and security, for example for Windows Media Player, the Windows error reporting service and others. The new Context Menu Manager enables you to view and manage the contents of right-click context menus in Windows, giving you full control. Popup context menus are displayed when you click the right button on your mouse. They?re useful and configurable and many programs add entries to them to allow you to give you direct access to special functions. The Context Menu Manager gives you detailed information on all the entries and enables you to activate or deactivate them for individual and multiple file types. The new Favorites tab makes using WinOptimizer 6 even easier by giving you direct access to the functions and modules you use most frequently. The program automatically lists the functions you use in the Favorites tab so that you can return to them quickly. Once you?ve used a function or module it becomes even easier to use it again. In addition to this the tab also displays interesting information on how you use the program functions ? date of use, frequency of use, last use and so on. Windows XP Media Center Edition 2005 is an operating system that enables you to enjoy the best in home entertainment, personal productivity, and creativity on your home PC in an easy, complete, and connected way. With Media Center Edition 2005, you can store, share, and enjoy all of your photos, all of your music, all of your home video, and even recorded TV in one sleek and easy to use place.Computers powered by Windows XP Media Center Edition 2005 are called Media Center PCs. 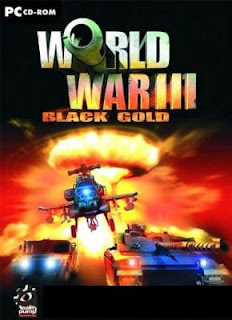 They are complete Windows XP-based PCs enhanced for home entertainment. These computers represent the evolution of home PCs into digital media hubs that bring together your entertainment choices and allow you to access them with one remote control. In December 2007, J.K. Rowling unveiled The Tales of Beedle the Bard, a very special book of five fairy tales illustrated by the bard herself, embellished with silver ornaments and mounted moonstones. Amazon was fortunate to come into possession of one of the original copies, and it was our privilege to share images and reviews of this incredible artifact. Now J.K. Rowling is giving millions of Harry Potter fans worldwide cause for celebration with a new edition of The Tales of Beedle the Bard, available December 4, 2008. 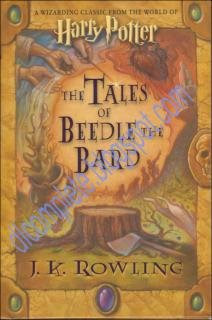 "The Tales Of Beedle The Bard" is a collection of stories written for young wizards and witches. Offering the trademark wit and imagination familiar to Rowling's legions of readers--as well as Aesop's wisdom and the occasional darkness of the Brothers Grimm--each of these five tales reveals a lesson befitting children and parents alike: the strength gained with a trusted friendship, the redemptive power of love, and the true magic that exists in the hearts of all of us. Rowling's new introduction also comments on the personal lessons she has taken from the Tales, noting that the characters in Beedle's collection "take their fates into their own hands, rather than taking a prolonged nap or waiting for someone to return a lost shoe," and "that magic causes as much trouble as it cures." But the true jewel of this new edition is the enlightening and comprehensive commentary (including extensive footnotes!) by Professor Albus Percival Wulfric Brian Dumbledore, who brings his unique wizard's-eye perspective to the collection. Discovered "among the many papers which Dumbledore left in his will to the Hogwarts Archives," the venerable wizard's ruminations on the Tales allow today's readers to place them in the context of 16th century Muggle society, even allowing that "Beedle was somewhat out of step with his times in preaching a message of brotherly love for Muggles" during the era of witch hunts that would eventually drive the wizarding community into self-imposed exile. In fact, versions of the same stories told in wizarding households would shock many for their uncharitable treatment of their Muggle characters. Professor Dumbledore also includes fascinating historical backstory, including tidbits such as the history and pursuit of magic wands, a brief comment on the Dark Arts and its practitioners, and the struggles with censorship that eventually led "a certain Beatrix Bloxam" to cleanse the Tales of "much of the darker themes that she found distasteful," forever altering the meaning of the stories for their Muggle audience. Dumbledore also allows us a glimpse of his personal relationship to the Tales, remarking that it was through "Babbity Rabbity and Her Cackling Stump" that "many of us [wizards] first discovered that magic could not bring back the dead." Malware Defender is a HIPS (Host Intrusion Prevention System) with low resource usage and latency. It is effective to protect your computer system from all forms of malware (viruses, worms, Trojans, adware, spyware, keyloggers, rootkits, etc.). Malware Defender is also an advanced rootkit detector. It provides many useful tools that can be used to detect and remove already installed malware.Whether you are an expert or not, Malware Defender is your choice to protect your system. Monitors process, file and registry activity for suspicious behavior. Detects all forms of malware, whether known or unknown. Supports learning mode and silent mode. Detects hidden processes and threads. Detects unsigned processes and modules. Kills processes and threads using advanced method. Detects hidden kernel modules and kernel threads. Kills, suspends and resumes kernel threads. Kills kernel DPC (Deferred Procedure Call) timers. Detects and removes system service table hooks (SSDT hooks). Detects and removes Win32k service table hooks (shadow SSDT hooks). Detects and removes interrupt descriptor table hooks (IDT hooks). Detects and removes SYSENTER handler hook. Detects and removes kernel object hooks. Detects and removes kernel notify routines. Detects and removes kernel mode code hooks. Detects and removes user mode code hooks. Detects and removes global message hooks. Detects hooked driver dispatch routines (IRP hooks). Scans all known autostart locations. Detects newly added autostart entries. Undoes and redoes deletion of autostart entries. Detects hidden files and folders. Shows and deletes NTFS Alternate Data Streams (ADS). If you Google technical problems you must have encountered Experts-Exchange.Com page as a possible solution to your problem only to find that you need to buy a paid-subscription and upgrade to Premium Membership to view the solution, However, you can simply scroll to the bottom of the page to see all the answers including the solution. The best way to get full-access to site with the ability to ask questions from experts is to signup for an Experts-Exchange account, but using the Signup link provided on the website requires credit-card to purchase the premium membership as shown below. However, there is a pretty unknown backdoor signup link allowing you to signup for free as shown below. Less seeking - CopyFaster’s finer control over the copying process causes less time-consuming movement of the hard disk head. CopyFaster will try to read from the same section of the hard disk (where the head is positioned) multiple times before causing the head to move to another position (which is time consuming). 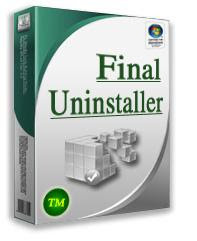 • Uncached file access - CopyFaster bypasses Windows 2000’s file cache which normally speeds up repeated access to the same file, but is less useful for big files. Bypassing the file cache prevents extra wasted memory-to-memory copying from occurring. More efficient than an anti-virus! Isolate good from evil. DefenseWall HIPS (Host Intrusion Prevention System) is the simplest and easiest way to protect yourself from malicious software (spyware, adware, keyloggers, rootkits, etc. ), that can not be stopped by your anti-virus and anti-spyware programs, when you surf the Internet! Using the next generation proactive protection technologies, sandboxing and virtualization, DefenseWall HIPS helps you achieve a maximum level of protection against malicious software, while not demanding any special knowledge or ongoing online signature updates. No signatures, no popup windows, no false positives. It is just reliable and transparent protection, easy to use and strong. 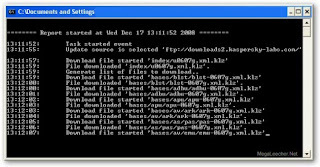 how to update Kaspersky products offline, one of the discussed method made use of a pretty unknown official Kaspersky updater utility, the free command-line utility is now in public beta and allows downloading of all Home and corporate Kaspersky Lab's product updates to a folder of your choice for offline update, the good thing is that the new version now supports a GUI to control the CLI Universal updater utility. Using Kaspersky Universal Updater is pretty straightforward, all you need to do is to download the utility and GUI companion from here, extract both the programs in a single folder, configure options using the GUI and click start which will launch the CLI downloader, The Kaspersky Universal Updater is also smart and only downloads differential updates on subsequent runs, so once the initial updates are downloaded subsequent runs will only download few KB's. 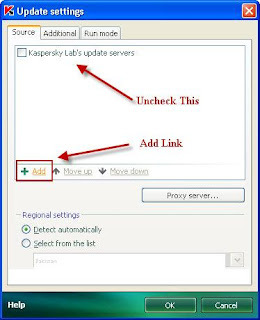 Once all updates are downloaded to your folder of choice you can follow the update method described Below to update your Kaspersky products offline. f you are stuck without an internet connection and need to update your Kaspersky Anti-Virus 2009 or Kaspersky Internet Security 2009 you can perform an offline update via the inbuilt feature provided by the software or standalone updating utility provided by Kaspersky, I will be sharing two methods for performing offline updates for your Kaspersky products from a local folder. 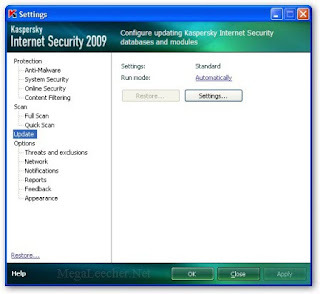 For using the first method you will need a computer installed with Kaspersky Anti-Virus 2009/Kaspersky Internet Security 2009 having access to internet, from this computer we will be copying the downloaded updates and then apply them to other computers without internet access, version of products installed on source and target computers should coincide. 1. 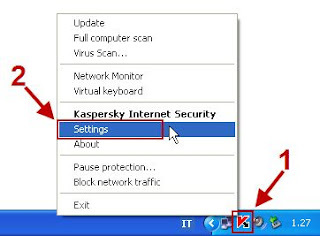 Right-click Kaspersky system-tray icon and select Settings as shown below. Click on the Update option from the Settings screen. # From the right part of the window click the Settings button and then goto Additional tab. # Enable the checkbox option Copy updates to folder. 5. Use Browse button to select a different output folder from the default. 6. click OK to close each window. 7. Run update so all anti-virus databases updates are copied to your folder of choice selected in Step No. 5 above. 8. Copy all the files inside the folder selected in Step No. 5 above to target computers or removable media. # From the right part of the window click the Settings button and make sure Source tab is selected as shown below. # Clear the checkbox Kaspersky Lab’s update servers. # Browse the folder on local or removable disk into which databases and application modules have been previously saved. # click OK to close each window. # Run the update process. 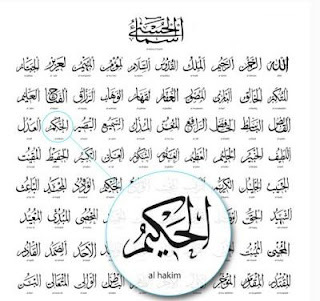 Here are the 99 names of Allah in some different formats. 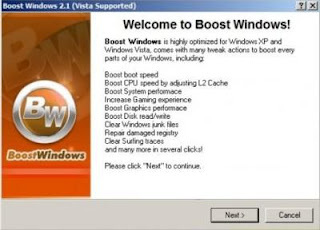 Boost Windows 2009 is a revolutionary system booster. Unlike other similar software, they may require you know much knowledge of computer like registry editor, system configuration, and you may have to take the risk of damaging your system. 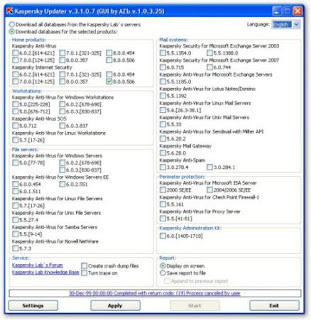 With Boost Windows 2009, you can complete the system optimization in a few "Next" clicks. Your Windows will be fine-tuned to a perfect status - like it was just completely reinstalled with all updates, fast, reliable, and safe. Improving the performance and privacy of a PC was previously the job of experienced IT specialists. Boost Windows 2009 combines a range of professional level tools that specifically target system performance optimization, privacy enhancement and hard disk cleanup. System settings, Internet usage, disk clutter, RAM and CPU are all automatically scanned, cleaned and optimized for peak performance. 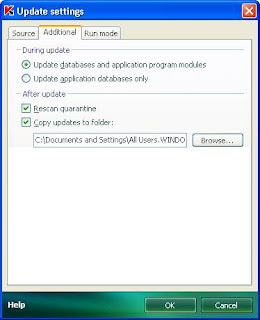 With Boost Windows 2009 running regularly, you can keep Windows clear and stable, never have pain to reinstall Windows time to time. From our tests, Boost Windows 2009 can boost Windows system for 30% to 50%, including boot and shutdown, program running performance, game FPS, etc. You can get all these with a few mouse clicks, all operations are automatic and safe! Antechinus Animator Professional - Easily create animations, videos, images and sound. Unique animated effects. Antechinus Animator Professional easily creates and edits animations, images, videos and sound files: Over 40 formats supported. Have your first animation running in LESS THAN 5 MINUTES with morphing or multitudes of other animated effects. No need to guess: see in real time what happens as each option is changed. Show-case your product/service or enhance your family photos with stand-alone musical slide-shows. View and organize all images on your computer. Save time: process, convert, and do multiple changes to multiple files in ONE SINGLE go. You can even do it from other programs or command line. Waste no time on repetitive animation/imaging jobs - Animator automates intelligently everything that can be automated. Give new life to your family photos: enhance and perfect them with over 30 filters and effects. Optimize files to load your web pages up to 75% faster. Reduce the size of already compressed images by further 40-65% with the best compression tools available. The preview lets you see how the image will look like and how big it will be in the optimized state. You even know how fast it will load depending on your visitors' connection speed with the built-in download time calculator. Also, create roll-over buttons for the web with one click, and visually create image maps. Enhance the visual appeal of your images with drop shadows, embossing, and blending. Illustrate your documents, presentations, web pages, or applications with advanced screen and resource capturing. Capture anything of any shape you see on screen, manually or automatically, or capture images, icons, and cursors embedded into programs (.exe) and dynamic libraries (.dll). ever before seen precision polygon/freehand capturing with zoom preview. Capture images directly from scanners, cameras and other devices, to retouch and perfect them. Audio Video Interleaved (avi). This format is widely supported, with varying quality/compression ratios depending on the codec you select. Avi files can contain sound.Autodesk FLIC/FLIC-Pro (flc, fli). This is a 256-color animation-only format.CompuServe Graphics Interchange Format (animated gif). This format is Widely used on the Internet. 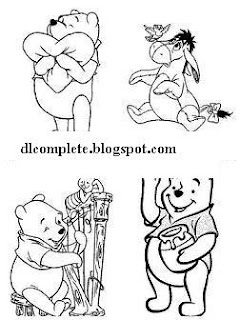 Animations are highly compressed and can have up to 256 colors. Animated gif cannot contain sound.High quality Audio Video (hav). This format is rarely used, but useful for lossless compression of audio and video. Mpeg (mpg, mpeg, mpe, m1v, m2v, mpeg4). This format is widely supported and highly compressed. MPeg files can contain sound.QuickTime (mov). This format originated on Macintosh, but is now widely supported. It offers multitudes of compression types.Windows Media Video (wmv). 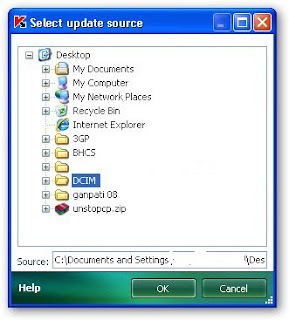 Lean, efficient Windows format. It comes with the set of profiles defining the output quality and other properties depending on intended use (intranet, dial-up, broadband, etc). 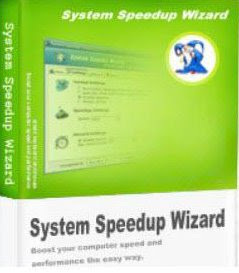 System Speedup Wizard is a program which allows you to run programs much faster than the original programmer intended. You can easily make programs & games run faster on your computer without having to purchase a new PC. Many programs and games often use a maximum amount of CPU power which often leads to the CPU being idle and really useless at all. Babylon Pro offers its users a wide range of titles from the world's premier publishing houses including Oxford University Press, Britannica, Merriam-Webster, Larousse, Vox, Langenscheidt, Pons, and Taishukan. 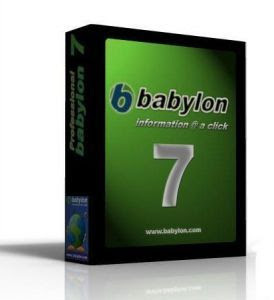 New version Babylon six offers text translation in 17 languages in addition to single word and phrase translations - all in a single click, results from Wikipedia encyclopedia in nine languages, automatic spelling feature, and accurate results in a single-click from a wide range of authoritative sources. Babylon Pro - an easy and intuitive translation and dictionary software in over 75 languages. With Babylon 7, text translation has never been easier, no more "copy/paste" or unnecessary browser windows. Just click on any text in Word, Excel, emails, instant messaging, web pages and other desktop applications. All you need is a single click away. Xtravo Explorer is faster than any other browser to date. 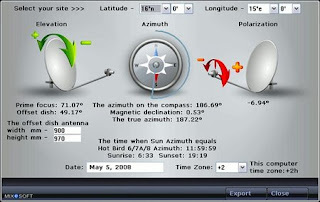 Xtravo Explorer is powered by Internet Explorer and opens all heavy websites in 10 seconds when using DSL128/kbps and a Dial up connection. This CS4 Edition is Tweaked on the ~RAMsize.DLL To work perfectly with users with 2GB Ram. Photoshop normally works slow after 2 Weeks usage, Because it's requirements are for 1GB RAM. This Release works 100%, Changed Dialogs and Made Portable. You can install Any Preset (Brushes, Patterns etc.) In the Photoshop Folder. 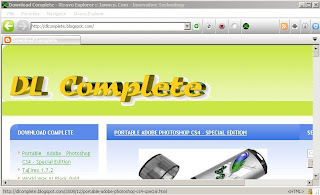 Recommended is to Install this SFX on the following path: C:Program FilesAdobePhotoshop CS4 Usage is same as the Normal CS4. Place Brushes and more in the Photoshop CS4Presets Folder.© .Hancock. - i Am not resposible for Any loss of data, Nor Hardware errors. This note does not mean Photoshop Will cause any problems, i Can promise you. Get instant access to Adobe Bridge CS4 with faster start-up,use new workspaces to jump to the right display for every task,easily create web galleries and PDF contact sheets, and more. colors into a single color-corrected image. Shows you the name, picture and company (or any other data) on an incoming phone call! All you need is a modem, ISDN-adapter or any other phone device that supports CallerID and is connected to your machine or any other computer in your local network. With TapiRex, you will always know who is calling you at the first ring of your telephone!When your telephone rings, TapiRex will look into your contacts to let you know who is calling and show the name, image ad any additional info of the caller. The contacts can be stored in any Database or the program can import the contacts' information and image from Microsoft Outlook®, Skype® or the Windows Address Book (WAB). The name of the caller or the callerID can be spoken via Windows speech-output. If a callerID is not in your contacts, the program tries to lookup the name of the caller in the internet.